Name tags and booklets await guests at the welcome table. Here’s a sample entry from the exhibit, along with snapshots of guests browsing the exhibit during the reception. The fifth annual reception, held in 2014, was triple the size of the first. The University of Arkansas (www.uark.edu) is a land-grant research university located in the scenic Ozark Mountains of Northwest Arkansas. It serves more than 26,000 students. Here at the University of Arkansas Libraries, we actively seek outreach opportunities to build relationships and to strengthen ties with our faculty members. Their hectic and varied schedules often limit their interaction with our library’s own faculty, staff, and services. Sadly, many teaching faculty are unfamiliar with library services, holdings, and personnel, and so they never think of turning to us to meet their teaching and research needs. Like many of our peers at other academic institutions, we try to craft outreach programs that wildraw professors into the library facilities, which is often a necessary first step toward building successfupartnerships. I was the public relations coordinator for the libraries for 8 years. During part of that time and continuing into my current position of assistant to the dean of libraries, I’ve been running a series of receptions that has succeeded in bringing in faculty and familiarizing them with some of what the libraries have to offer. 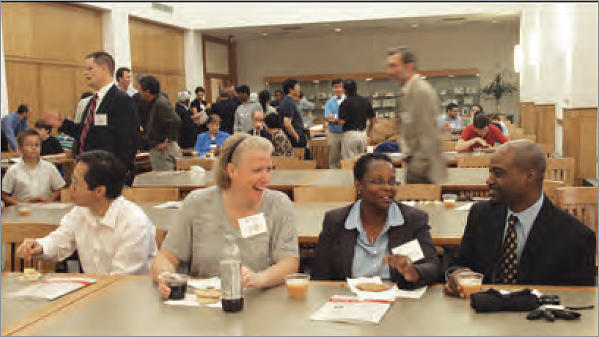 In 2010, University of Arkansas provost Sharon L. Gaber asked dean of libraries Carolyn Henderson Allen to host a reception in the Mullins Library’s spacious Walton Reading Room. Gaber based her request on a similar program from her previous post at Auburn University, which honored faculty members who had received promotions or tenure. This seemed like a golden opportunity to craft an outreach program with strong ties to the libraries, so we agreed. The dean tasked our team, called the Dean’s Right Hands, to brainstorm “something cool.” The Right Hands includes the public relations coordinator, the dean’s assistant and administrative assistant, the facilities coordinator, and the development coordinator. 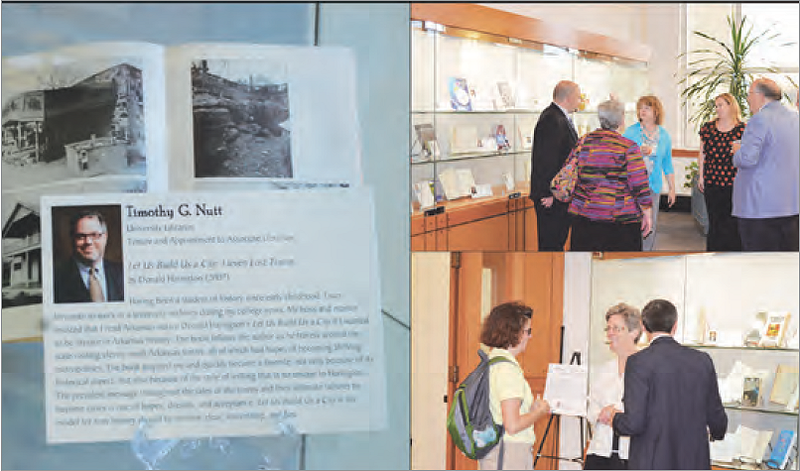 Since we work in an academic library, and since the Walton Reading Room is equipped with a large display case, we got the idea of focusing the program on commemorative books. We decided to invite each professor who had earned a promotion and/or tenure to nominate a book that had influenced his or her life or career. With this list, we would create an exhibit and a commemorative booklet that featured the honored educators and their chosen books. Thus, the Promotion and Tenure Reception was born. The provost gave us a smalbudget for the first year’s event. This program was logistically challenging in its first year, but now, 5 years on, we have the preparation down to a science. There are four main parts: the commemorative booklet, the exhibit, the reception, and the webpage. But it alstarts with letters of invitation. The responses start trickling in over the next 2 months, and I have to keep them organized, updated, and edited for clarity and completeness. I use an Excespreadsheet with columns for faculty member name, new title or position, department, department chair (for the invitations), RSVP, number of guests, the author and title of the chosen book, and the faculty member’s comments on the choice. As the deadline for faculty submissions approaches, I emaireminders with subject lines that gradually increase in immediacy from “Reminder” to “Urgent” to “Immediate Action Required.” I am always very carefuto be respectful, polite, clear, and direct in alof my communications with faculty. But, quite frankly, I am not above stimulating competitiveness among the group by, for instance, letting them know that their peers have made more timely or better submissions. Mostly, I rely on dogged persistence and an annual, unshakable goaof getting 100% cooperation. Even so, each year I have to track down nonresponders; of the 45 or so invitees, four or five wilmiss the deadline for submissions. In these cases, I contact their department heads, then the deans, then much more rarely, the provost, to get a response. I have only had four complete “no-shows” in the 5 years we’ve run the program, proving that persistence pays off. Over the summer, I begin working on the four parts of the project. Commemorative Booklet: I use Adobe’s InDesign to lay out the booklet, listing professors in order of rank. Each entry includes the professor’s name, college, department, and new rank or title (or just “tenure”), as welas the title of the book selected, the book’s author and date of publication, and the professor’s comments about the significance of the book. The formaportraits accompany each entry. We have a student graphic designer on staff who creates a new booklet cover each year. Exhibit: To build the exhibit, I begin gathering nominated books as soon as the recommendations arrive. When I receive a faculty member’s nomination, I check the catalog to see if we already have a copy that can be bookplated. If we don’t, I check online to see if I can buy one (many of these are older, out-of-print titles), then I send the orders to the acquisitions department. The books are paid for out of the collection budget; the totatypically runs about $300 a year. In July or August, depending on when the exhibit cases are open and when the majority of the books are available, I assemble the exhibit. I create placards that have the same information as the booklet, including the person’s photo, and have them printed and mounted on foam core board. I notify the honorees immediately when the exhibit is ready and invite them to drop by and see it prior to the event. Reception: We order lovely flowers and good food and drink, and we make families feewelcome by providing some kid-friendly finger food and by setting aside a coloring table for young kids. I send reminders to alinvited attendees the week before and day of the event. We provide name badges to help spur conversation. We invite the campus photographer, who takes informasnapshots during the reception. Webpage: After the third year, we created a database of the faculty submissions and an attractive “skin” (a presentation webpage for the database). There, people can browse the submissions to search for a particular book or faculty member or to sort the submissions in various ways (http://libinfo.uark.edu/info/facultytenurepromotion). Following the event, I send a copy of the commemorative booklet to any honored faculty members who were unable to attend with a note that says we missed them at the Promotion and Tenure Reception. I also send faculty members digitacopies of photos that feature them. They are particularly pleased when I can send shots of them posing with their families or guests. I’ve learned how to address various difficulties over the years to streamline this process. I’lshare my lessons here, starting with how we overcame some of the challenges from our first year. It was hard to contact or get information from faculty members who had left campus for the summer. Now we have the invitations ready to go out as soon as the board of directors has approved their promotion or tenure. The provost allotted some money for the first event, but not enough to cover printing the booklet in color. We have been able to increase that steadily over the years. Our most recent budget included $800 for food, $300 for flowers, $250 for sound equipment, and $1,050 for the glossy commemorative booklet—printed in fulcolor. We ran into trouble trying to order books in June because June 30 is the end of our fiscayear. Now we order as many books as possible before the “blackout” starts on June 1 and then order the remainder after July 1. It was difficult sending alof the booklet information to the printer in time. So we started by setting a deadline to get the booklet to the printer, then worked backward to establish realistic deadlines for faculty submissions. It was tough to find a time when the chancellor, provosts, deans, and faculty members could almake it. Now we plan for the same time every year—late on a Wednesday afternoon 2 weeks after the falsemester has begun. This also allows families with children to attend after school. We made the reception an invitation-only event. We invite the faculty members’ families and friends to celebrate their success. We invite deans, campus administrators, and department heads on behalf of their faculty member(s), listing those honorees by name in their boss’ invitations. We invite the chancellor and provost to speak at the reception. We create a permanent bookplate that lists the professor’s name and the occasion (i.e., “on the occasion of his promotion to Distinguished Professor”) and affix it to the book he or she has chosen. We print a very limited supply of the commemorative booklets and only give them to the honored faculty (and a few to the provost’s office). We feature each year’s book list on a permanent website. After the event, we send out a campuswide news story that includes highlights from the chancellor’s and provost’s remarks about the professors and their achievements. We send the honorees snapshots of themselves and their guests from the reception. Most of these tactics serve the same goal, which is to make the faculty look and feegood. Our university photographer, RusselCothren, takes exceptionaportraits for the booklet and shots of the exhibit, and his photos from the reception go a long way toward meeting that goal. The glossy booklets are attractive, and since there are precious few copies, they get passed around a lot during the reception. We can measure the success of the event year by year by the increasing attendance, but the long-term benefits of this outreach program are not so easily identified. I can say anecdotally that I know more professors due to my 5 years of managing this program, and that when I work with them on other campus matters, they seem more cooperative than others whom I do not know. I have even had a few faculty members contact me directly when they had a generalibrary question, simply because they knew me or trusted that I would take care of the matter. The reception drew nearly three times as many attendees in its fifth year as it did in its first. I believe that is in large part because faculty, department heads, and deans talk to their colleagues about the event, helping it earn a positive reputation. 1. Establish beneficiaconnections between the faculty members and the libraries. 2. Increase third-party credibility with the campus community and policymakers. 3. Increase awareness among faculty and other campus community members of library personnel, programs, and services. 4. Build lasting relationships with campus administration, and thereby win support for other projects and programs. When viewed as an outreach program, we can see the tangible benefits of the Promotion and Tenure Reception. It helps people from different campus units get acquainted and allows everyone in our community—staff, faculty, students, and administrators—to browse the selection of books on display and their accompanying descriptions to gain an insight into the faculty members’ development. The University of Arkansas Libraries can only benefit from targeted outreach programs. The stronger the relationships we can build with our faculty and administrators, the better off our libraries will be. Molly D. Boyd is the assistant to the dean of libraries at the University of Arkansas in Fayetteville. She holds a Ph.D. in literature of the American South from the University of South Carolina in Columbia. She was the public relations coordinator at the University of Arkansas Libraries for 8 years before taking her current job and continues to helm the annuaPromotion and Tenure program. Her emaiaddress is mdboyd@uark.edu.